Do a better job distributing your surveys and understand your customer base well. SurveyMonkey lets you create all types of web-based surveys like customer satisfaction, product feedback, market research surveys and so on. With the Zoho Campaigns - SurveyMonkey Integration, you can send out your email surveys to a large customer group very easily. Your surveys inside Zoho Campaigns. All surveys that you have created in your SurveyMonkey account are available in your Zoho Campaigns account. It becomes easy to get started with your email survey campaign. Templates made for your survey campaigns. 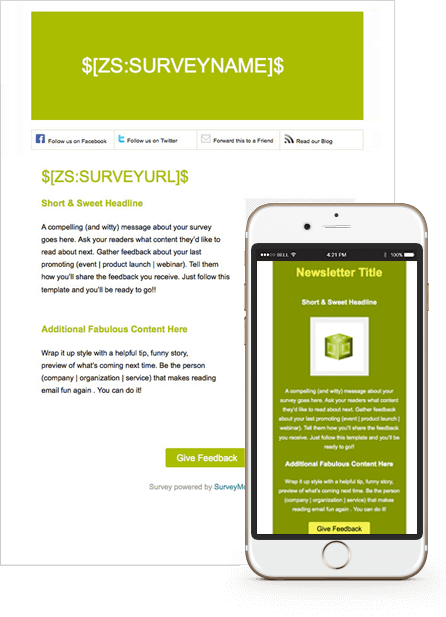 These templates are specially designed for your SurveyMonkey campaigns. All you need to do is to work on the email content. Zoho Campaigns will automatically route your subscribers to the right survey. There are a number of smart templates too. These are mobile-friendly templates that let you target the mobile audience. A business scenario: Get customer feedback. You are a Marketer. Your focus remains constant - knowing your customers and understanding their product needs. Your marketing spend includes email marketing programs too, and so you would like to make the best use of it to understand your target segment. You want to find out what your customers think about the product and how they feel about it. Based on this feedback, your team will make constructive changes to the product. You design a questionnaire in SurveyMonkey. You want to use Zoho Campaigns to send out this survey as an email survey campaign to all your customers. You have pulled customer data from Zoho CRM as a mailing list in your Zoho Campaigns account. 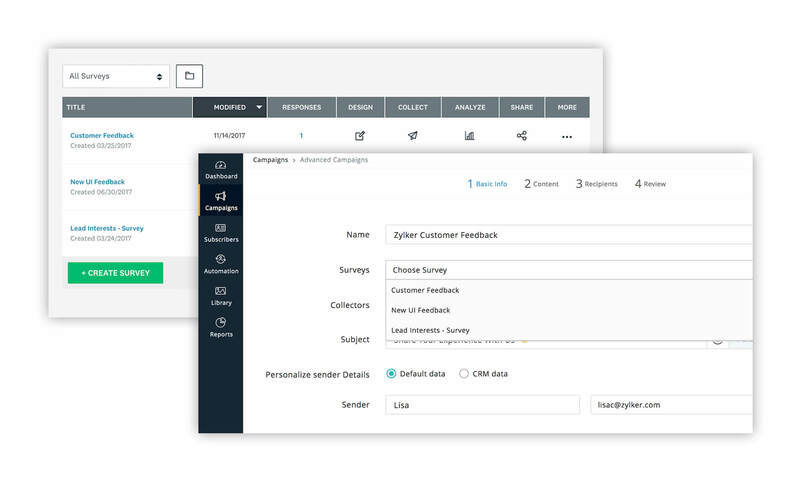 With the Zoho Campaigns-SurveyMonkey Integration, you can create a survey email campaign to distribute this survey to your customers very easily. Once the survey is sent out, you can also monitor its performance with Survey Reports.